For years, Belize City has had an unsavoury reputation for drug-running, money-laundering and muggings. With tourism now in mind, the government is working hard to improve its image. Straddling a creek on Central America's Caribbean coast, Belize City feels more West Indian than Latin. That is not just because a majority of the population of 50,000 plus is black, and speaks English. 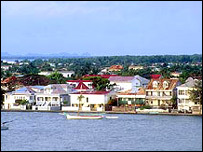 The town is said to be built on foundations made of ship's ballast and empty rum bottles, left by 18th Century British traders, who came to extract timber from the forests upriver. You can still see the sleeping quarters underneath the grander gingerbread houses, where African slaves used to be chained up for the night. The town's main drag, south of the swing-bridge that is Belize City's major point of reference, is called Regent Street, though it could be a million miles from the smart London thoroughfare after which it was named. As I walk along it, a Rasta man of about 30, sitting on his haunches outside a bar, offers cannabis with the single word "Weeeeeeeed?" I cannot suppress a laugh, as he says this in exactly the same tone of voice as the flower used to do in the Flowerpot Men, a television puppet show for children that was popular when I was a kid. He looks at me quizzically, as if he is wondering whether I am half-stoned already, or maybe making fun of him. Eyes firmly turned to the pavement, I hurry on my way. "Do not wander off the main streets." "Always take a taxi from the bus station." "Carry some dollars in an easily accessible place, so you can just hand them over if someone pulls a gun on you." Over the years, I had been given so many dire warnings about Belize City that I had studiously avoided it on earlier travels round Central America. But then more recently I had heard that the government was cleaning the place up, in an effort to boost Belize's tourist trade. Obviously it was time to put these reports to the test. A visitor stands out a mile in Belize City, as the humidity and the temperatures are so high that you are a dripping wreck before you have walked 200 yards. The locals, in contrast, saunter or cycle by in immaculately dry and ironed shirts, even the cheeky schoolboys who regularly stop to try and beg a dollar. You quickly learn to walk on the shady side of the street. And you make regular pit-stops at cooler buildings, such as St. John's Cathedral, at the bottom of Albert Street. The cathedral is made out of curious grey bricks that were, like the city's foundations, brought here as ship's ballast. Painted on a board outside, there is an earnest exhortation in Spanish: "Hoy, no manana" - today, not tomorrow. The locals do not exactly give the impression of having taken this message to heart. North of the swing-bridge, past a smart but anonymous shopping centre that is designed to cater for the burgeoning cruise ship trade, there is a part of town more open to sea-breezes. There one can see some of the urban planning that has been taking shape in the authorities' efforts to give Belize City a new image. Landfill is enabling them to build a sweeping promenade, and some of the old buildings - battered by the hurricanes that come blowing in from time to time - have been beautifully restored. Even if many of the local people are unemployed or poor, there is obviously a lot of money around as well. Outside the Princess Hotel - the city's finest - 4x4s and top-of-the-range limousines are lined up, while inside, the elite can enjoy the air-conditioned facilities. Bizarrely, the huge hotel lobby has 500 slot machines on one side, leading into a casino. On the other, there is a cinema showing The Passion of the Christ... four times a day. Talk about God and Mammon. I watch as a large American lady tourist pauses indecisively as she ponders these two alternatives, then heads off into the bar where they are selling pina coladas, two for the price of one. Back on the street, beaming smiles, tourist police on bicycles stop to wish one good-day. Still a comparatively recent phenomenon, these police are largely credited with the marked fall in assaults on foreign visitors. Their eagerness seems designed to extract the confession that one has not been mugged, or even felt remotely threatened. But as they ride off and I walk back to the main street, the Rasta man, still crouched on his haunches outside the bar, looks up, and laconically tries his sales pitch. "Viagra?" he intones. I chuckle, and he shakes his head, his great matted dreadlocks swinging from side to side. It is no use. I am clearly a hopeless case. From Our Own Correspondent was broadcast on Saturday, 1 May, 2004 at 1130 BST on BBC Radio 4. Please check the programme schedules for World Service transmission times.